This Baked Eggs Skillet with Avocado and Spicy Tomatoes is a delicious breakfast idea that’s Low-Carb, Keto, low-glycemic, Gluten-Free, dairy-free, Paleo, Whole 30, and South Beach Diet friendly. Use the Diet-Type Index to find more recipes like this one. Click here to PIN Baked Eggs Skillet with Avocado and Tomatoes! Baked Eggs Skillet with Avocado and Spicy Tomatoes! I’m always looking for new low-carb breakfast ideas, and recently when I had avocados in the fridge that needed to get used I came up with this Baked Eggs Skillet with Avocado and Spicy Tomatoes. If you’re wondering why my avocados were in the fridge, back in 2009 I shared a life-changing discovery that ripe avocados will stop ripening and last for several days longer if you store them in the fridge. Please tell me I’m not the only one who can’t resist those bags of avocados at Costco and then has a hard time remembering to use them? If you have the same problem, this trick of putting avocados in the fridge will really help! I’m totally in favor of avocado for breakfast, and this was a quick and delicious breakfast for two that only needs about 10 minutes in the oven. Personally I think Baked Eggs Skillet with Avocado and Spicy Tomatoes would make a delicious Meatless Monday meal for breakfast, lunch, or dinner. If you don’t care if it’s gluten-free or low-carb you could eat it with something like low-carb tortillas or whole wheat toast, but I just ate it alone, with a generous sprinkling of Green Tabasco Sauce. (To see more meatless recipe ideas, you can use either the label Meatless Monday or Vegetarian Recipes in the recipe index or visit my Meatless Monday Pinterest board. Before you start simmering the tomatoes, preheat the oven to 400F/200C and break 4 eggs into individual dishes and let them come to room temperature on the counter. (This is important or the yolks will get too done if you start with cold eggs.) I used these Ro-Tel tomatoes to make this recipe, and in case anyone is wondering, Ro-Tel has not paid me to use their tomatoes and they have no idea I’m sharing this photo. I will say that the Ro-Tel tomatoes are pretty spicy, so if you’re making this for kids I might use plain tomatoes with a little hot sauce added. The Ro-Tel can is smaller than usual canned tomatoes, so you’ll have to simmer a little longer to cook away the liquid if you make that switch. I highly recommend using a cast iron skillet. I used a 10.25 inch Cast Iron Skillet, which I thought was the perfect size. Even if your pan is well-seasoned, spray it thoroughly with non-stick spray or brush with oil. Then add the can of tomatoes and simmer until the liquid has mostly evaporated.While the tomatoes simmer, slice the avocado. After 4-5 minutes on medium, the tomatoes should have the water mostly evaporated. Turn heat to low and arrange the avocado slices over the tomatoes. Then g-e-n-t-l-y put each egg into a spot between the avocado slices. Season to taste with salt and fresh-ground black pepper. (I used Vege-Sal.) Put the skillet into the preheat oven and bake 10-12 minutes, or until egg yolks are as done as you like them. Serve hot! This Baked Eggs Skillet with Avocado and Spicy Tomatoes is a delicious breakfast idea! While the tomatoes simmer, peel the avocado, cut in half, and then cut each half into 5 thin slices. When all the liquid has evaporated from the tomatoes (about 4-5 minutes), turn the heat to low and arrange the avocado slices like spokes of a wheel in the pan. Gently put each egg between two avocado slices, spacing them evenly apart. Season to taste with Vege-Sal and fresh-ground black pepper. Put the skillet into the pre-heated oven and bake until whites are completely set and the yolks are done to your liking, about 10-12 minutes for runny yolks. Serve hot, with low-carb tortillas or 100% whole wheat toast if desired. This is good with Green Tabasco Sauce. I used Original Ro-Tel, which was plenty spicy for me in this recipe. Other brands of tomatoes with green chiles can be used, but note that Ro-Tel tomatoes come in a smaller size can. Use the Recipes by Diet Type photo index pages to find more recipes suitable for a specific eating plan. You can also Follow Kalyn’s Kitchen on Pinterest to see all the good recipes I’m sharing there. I have a quick question regarding the avacado…Do you remove the skin or is it edible? I am about to make this dish. It looks so good! Can't wait to eat it! 🙂 Thanks! Oh my, how I hate it when I make dumb mistakes like that! And thanks for telling me; hope you enjoy! Editing now! One important thing to say is: when you going to bake an avocado, must be real quickly, otherwise they become terribly bitter. Nada, I've never heard that before. In any case they were fine in this recipe. when using plain, chopped tomatoes, (couldn't find any spiced ones) what type of spice should be added? I'm making this for today's breakfast! I have no way to know just what spices are in Ro-Tel tomatoes (the can just says spices) but definitely they have diced green chiles. I think Mexican spices like cumin and chili powder would go well with this. Thanks Trish, glad you liked it. And I'm happy to hear I'm not just a wimp on the Ro-Tel. It was plenty spicy! This was absolutely delicious. I love the way the Rotel tied everything together. I do have to say that I usually eat foods at a higher heat level than most, however, I would not have used the Hot Rotel either. The original Rotel has more than enough flavor for this dish. Thanks for the recipe! Jeanette, I agree! Although I'd say avocados are good with just about everything! 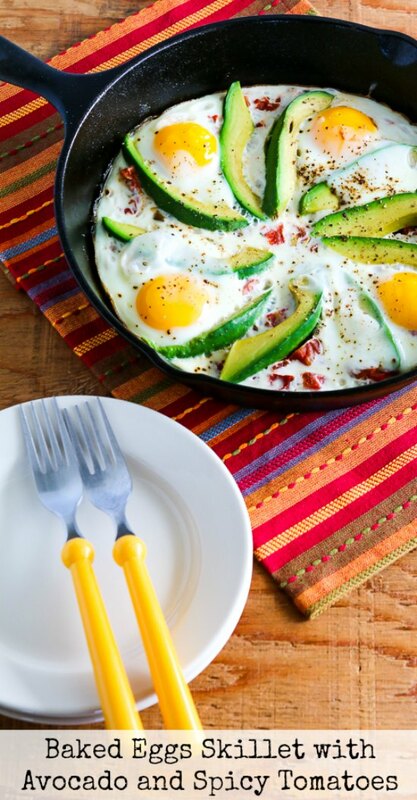 Love how pretty this egg skillet looks – avocados seem to have a natural affinity with tomatoes and eggs. Thanks Joanne, glad you like it! I love this breakfast! And your tip for the baked eggs is priceless. I can never get mine to cook right! Thanks Janel, we loved it. I love avocados and baked eggs, but have never tried them together. Sounds like a nice, light dinner. Thanks Pam! Bringing the eggs to room temp will make a huge difference! I love your tip about cracking the eggs and letting them come to room temperature! I can never get baked eggs just how I like them. Thanks, it was definitely delish!